You can test this EA on backtest. In backtest EA open ramdom trade and also EA copy that trade. So you can test this EA before buy it. ---> This is not a copier for trades from one terminal to another. ---> The utility is sufficient to install on one currency pair. By default, it will monitor all open symbols. MagicNumber To Copy: Magic number of the order to copy, multiple magic numbers can be specified separated by commas (example: 12222,1234687....). An empty value means that all orders will be copied. Symbol To Copy: Symbol of the order to copy, multiple symbols can be specified separated by commas (example: EURUSD,USDJPY....). An empty value means that all orders will be copied. 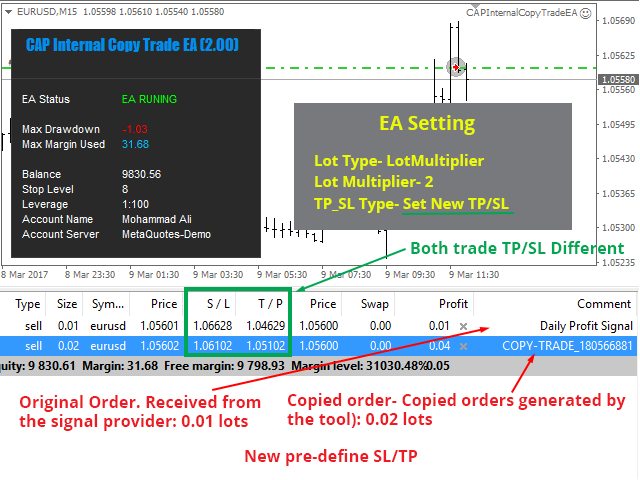 Trade's Comment To Copy: Put trade comment of the order to copy, multiple comments can be specified separated by commas (example: cap zone recovery ea, Universal...). An empty value means that all orders will be copied. CopyOnlyProfPosPoint: Duplicate only those transactions, which is higher than the profit CopyOnlyProfPosPoint points. Ignore All Exit Signal: If true, the utility will not close its copy trades, if the original trade is closed. Allow Slippage In Points: Maximum price slippage allowed to open trades. 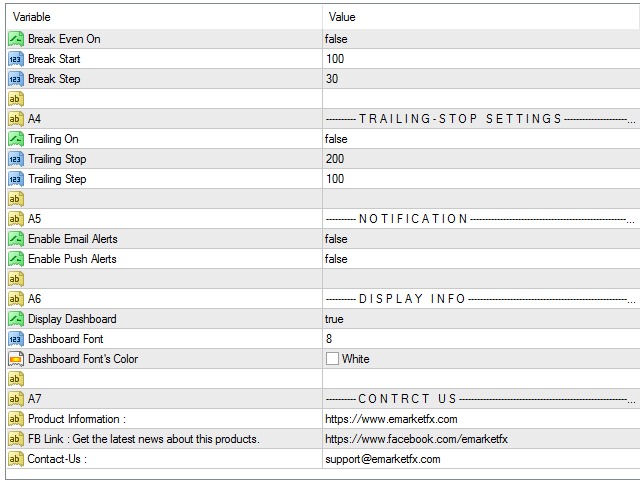 Ignore Copy Existing Order: If true, when you attach the utility on a chart already having some existing trades, the utility will ignore them. Reverse Duplicate: If true, reverse trades (Example: if the original trade is buy, a copied trade will be sell). Add Lots: Value of added lots. Fix Lots: Value of fixed lots. 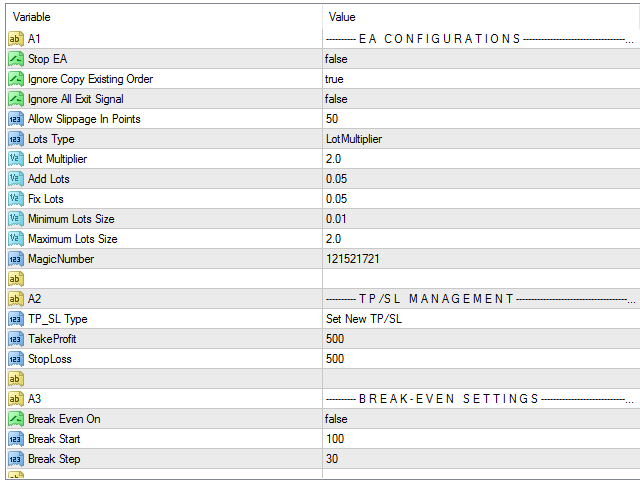 TP_SL Type: Takeprofit and stoploss type. StopLoss: New stop profit value in points. A very good and versatile EA! --Bugs Fix - CopyOnlyLossPosPoint and CopyOnlyProfPosPoint doesn't work properly. This version was fix that problem. --> Changed the company name and contact email.